This article by Vera Thoss, Lecturer in Chemistry, was originally published on The Conversation. Read the original article. When walking along the beach, some objects might seem unusual because they are neither pebble nor shell nor seaweed. They can be covered with a soft white layer that looks a bit like cotton wool. They may appear hard or waxy, and sometimes have objects trapped within. And a smell that has been described as “a cross between squid and farmyard manure”. Dogs with their keen sense of smell often find these objects first. A suspect lump, but not ambergris. : Vera ThossIf you find one of these, you might hope for ambergris – sometimes referred to as “whale vomit” – as one couple recently reported finding in Morecambe Bay in Lancashire, UK. Described as floating gold, it’s a highly-prized natural treasure used by past kings and still sought after by artisan perfumers. According to reports, this latest could be worth £50,000 (US$71,000) for a 1.57kg lump. 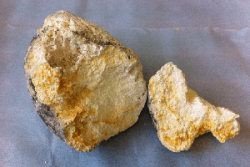 So what exactly is ambergris and why does it still cost more than gold or truffles? The reason for the high prize lies in the origin of ambergris. It is a product of the sperm whale, as only sperm whales make the compound responsible for ambergris’ allure: ambrein. Different organisms biosynthesise different compounds, such as caffeine made by cocoa, coffee or tea plants. Ambrein is made by sperm whales only to glue together squid beaks. Squid is the main diet of sperm whales but as the beaks can’t be digested, they need to be passed out without causing injury. They do this by coating them with ambrein. Ambergris starts as a mixture of squid beaks, ambrein and another digestive product called epicoprostanol. Once expelled – usually as faecal matter but also through vomiting, hence the name – ambergris floats in the ocean, turning from a “lump of poo” that smells of faeces into floating gold that has incorporated the varied smells of the sea. Visually this means ambergris starts more as a black lump and slowly bleaches. This ageing process is suspected to have two chemical effects: the reduction in the scent of faeces, which is more water-soluble and gradualy lost, and the incorporation of the scents of the sea, which is fat-loving and absorbed by the waxy ambergris in the making (much like butter in your fridge takes on the smell of other things). The longer it floats in the sea, the waxier it gets. 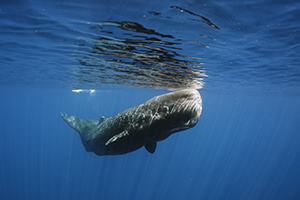 As Sperm Whale numbers decline, so ambergris becomes rarer. : Image:Amila Tennakoon CC licence via https://www.flickr.com/photos/lakpura/15538890511/in/album-72157648715111306/Considering that not every sperm whale poo includes lumps and that the numbers of sperm whales are much lower these days, it’s clear why this ambergris is so rare. Ambergris has been used in some expensive perfumes as it allows scent to last longer, in part because the ambrein molecule on exposure to a certain type of activated oxygen, creates fragrance compounds that are lighter and are more volatile or smelly, and they may take other volatile molecules present in ambergris with them. But these days perfumiers mostly use synthetic versions. Ambergris was also thought to be an aphrodisiac and a study found found that it acted as a sexual stimulant in rats. Not all that shines is gold, however. Suspect ambergris finders quickly get excited about their discovery. A “hot needle test” is recommended to confirm that it is ambergris – a test and this is where the challenge starts. Touching the waxy lump with a hot needle should melt it, release white smoke and give off an interesting smell. Let’s consider other substances washed up on the beach that also react positively to this test: candle or paraffin wax, residues from palm oil distillation, rubber, or solidified sewer grease. As far as abundance is concerned, there is much more wax or vegetable oil about compared to ambergris. Some of these compounds find their way into the sea through pollution: by falling overboard; becoming dislodged from sewer pipes; or discarded elsewhere. All of these waxy substances will be smoothed by exposure to the sea for longer periods of time and bleach. The sea also has a habit of bleaching any object, hence the whiteness of driftwood. One test for ambergris is to poke it with a hot needle and a liquid should ooze out – try the “hot needle test” with a candle at home. But many waxy objects melt when exposed to heat. As for the white smoke, most objects immersed in water take on some of it. Most wet objects burned give off white smoke, similar to what you might think of coal-fired power stations. And then there is the smell of ambergris – one would expect ambergris to smell unlike anything else smelled before. However, our sense of smell usually works by association. Some may find it revolting, some might start to think it smells like perfume, because they’re thinking of it in that way. I have been sent many samples where the sender referred to the smell as attractive and I found it revolting. With few people having smelled ambergris, then, it’s hard to say whether you’d smell rancid oil or something sweeter. Dogs, on the other hand, are quite attracted to smells we find rancid. Ambergris is rare. Hoped-for ambergris is much more likely to be what you’ve found if you stumble upon that waxy, stinky blob. Increasingly, oil residues, be they derived from petroleum mining, vegetable oil refining or sewers, find their way to our beaches. Marine organisations are keenly aware of this pollution, but not everyone else is, unfortunately. If you do encounter a strange rock that smells unusual, think twice whether the smell is what you would like to put on your body or whether it is more unpleasant. If the latter, it is most likely not ambergris. If still in doubt, send me a sample.